…. and the “root or shoot first?” experiment. My daughters visited a craft fair recently and returned with an intriguing present for me – a bag of eco soil. You’re probably picturing in your mind a big, heavy compost-sized bag but it was tiny and contained what looked like lots of miniature yellow beads. After soaking in water for a few hours we ended up with a mass of soft, water-filled capsules as in the photograph on the left. The leaflet describes the eco soil as a water and soil substitute for flowers and indoor plants and we love it! Once we’d managed to stop running our fingers through it (it’s very tactile) we decided to use it for a little experiment with a runner bean seed. 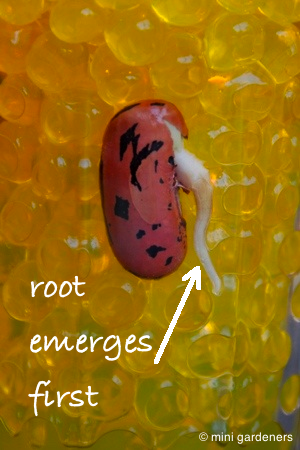 We wondered if the shoot or the root would emerge from the seed first or whether they’d both appear at the same time. Less than a week later and the results are in: the root appeared first. Not totally surprising as the plant needs to anchor itself and be able to take up water and nutrients but did you guess correctly? 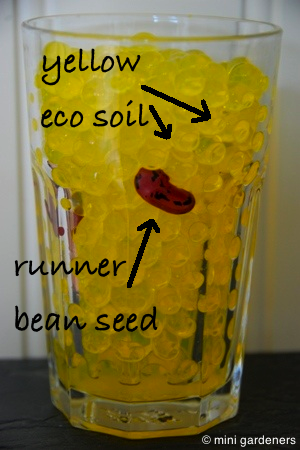 Categories: beans, experiments, projects | Permalink.